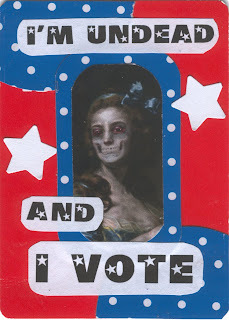 I'm Undead and I Vote! It is time once again for those of us on the Ten Two Studios design team to meet Lisa Vollrath's Halloween challenge. 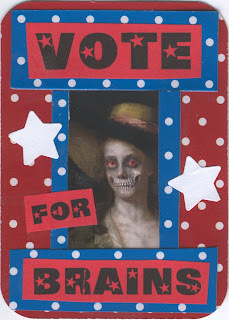 Since it's an election year and I live in a battleground state, I figured some political ATCs were needed, using zombies, witches and a dapper Day of the Dead gent. The initial theme and color scheme were inspired by Steve Hockensmith's latest novel Cadaver in Chief in which the president of the United States is suspected of becoming a zombie. Inspiration also came from Terry Pratchett's Discworld novels which feature a plethora of undead characters including Reg Shoe, the first zombie member of the City Watch and an activist for dead rights. 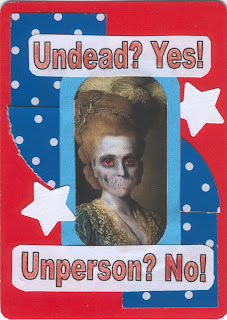 From his Fresh Start Club, we get the slogan "Undead Yes, Unperson No." 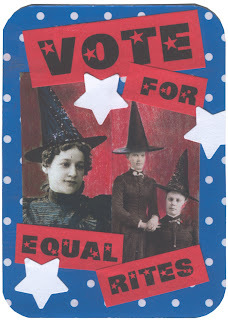 Pratchett also wrote Equal Rites about a girl who inherits a wizard staff but is told that women can't be wizards. Although apparently claims of the dead voting are more myth than reality, shouldn't the dead be allowed to vote if they can get themselves to the polls on time? 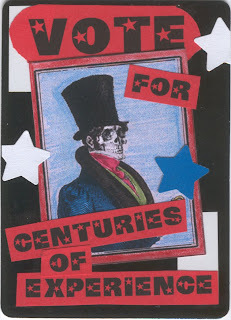 Just think of the years of experience that the undead might bring to elected office! After all, being dead is only the beginning!